Hey folks! Unlike the meatloaf recipe I posted the other day, this is something my wife really loves, but the kids, not so much… Anyway, this is a great lunch option (I like it on toast with a slice of tomato) or a really neat hors d’oeuvre served on small toast rounds or crackers. The horseradish in this salad gives it a nice kick. Even better, you can literally whip up a batch in about 10 minutes. Give this a try and I know you’ll be making it regularly! 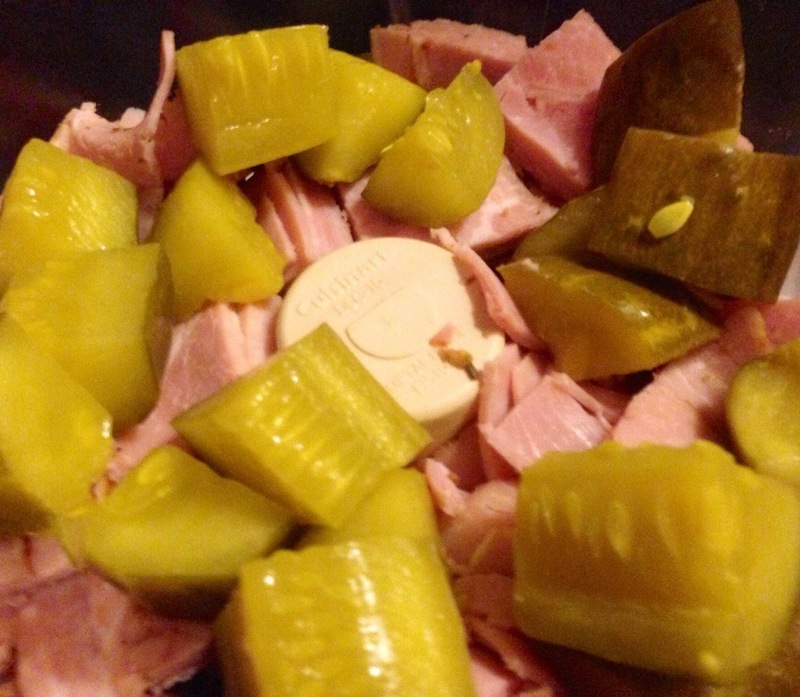 Roughly chop the ham and the pickles into 1″ pieces and place in a food processor. Pulse until well chopped, scraping down any larger pieces and reprocessing until everything is nicely combined. If you don’t have a processor, you can simply finely chop the ham and pickles separately with a knife and mix them together. 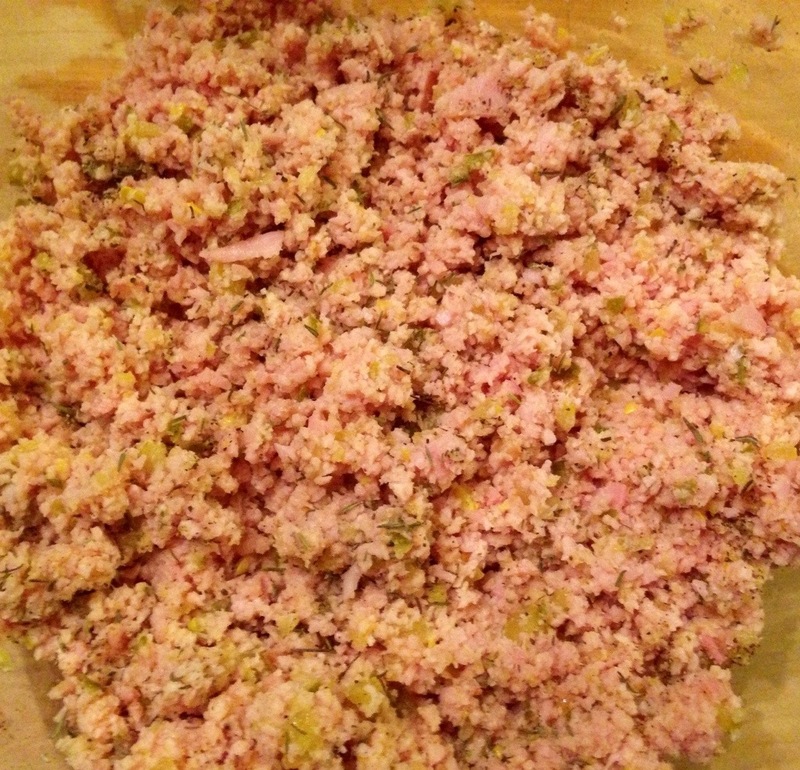 Place the mixture into a large bowl. Add all the remaining ingredients and mix thoroughly. I tend to make this fairly dry, so if you prefer more mayonnaise, by all means add to your taste. Of course, you can adjust the horseradish amount as well. I would say the 1.5 tablespoons is a moderate amount of kick in this recipe. Speaking of the horseradish, I used a deli “sauce” but a mayo-based version would be fine as well. 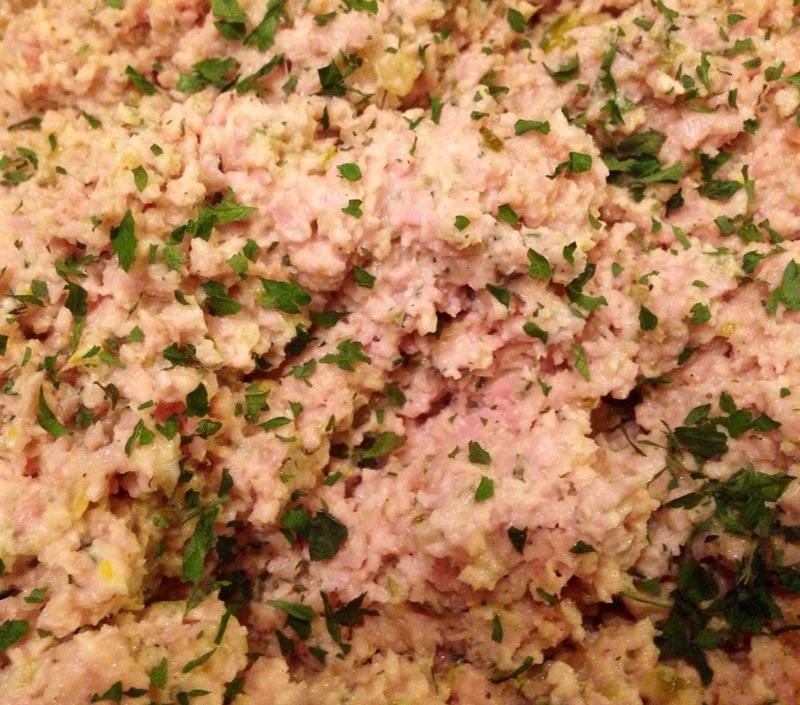 Top with a little more parsley and you’re ready to eat! Again, this salad makes a great sandwich with your favorite bread and veggies, but this time we served it as an hors d’oeuvre with some Kalamata olives. 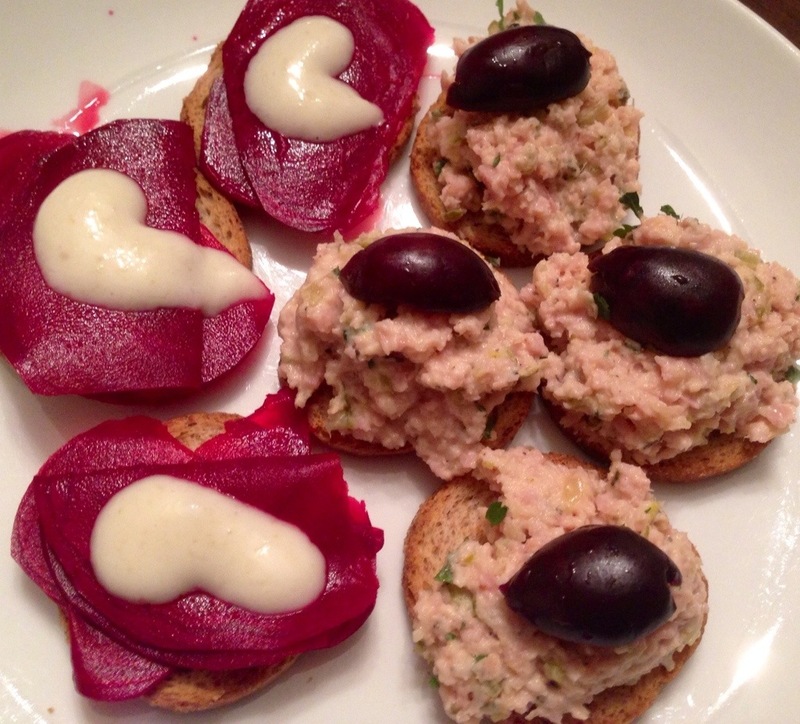 The accompanying hors d’oeuvre in the picture is a very simple beet recipe (minus the salmon) from Fine Cooking that is just tremendous. 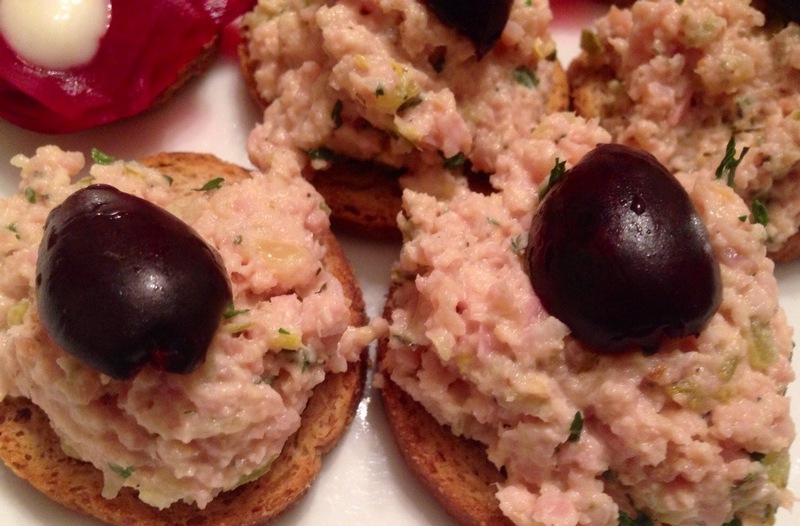 It goes great with the ham salad, and it really is just too good not to share. I hope you make this really easy ham and pickle salad. I’m sure you’ll enjoy it! This entry was posted in hors d'oeuvres, Lunch, Make Ahead, Salad, Sandwiches, Weekday and tagged ham, horseradish, mayonnaise, mustard, pickle, Salad, thyme. Bookmark the permalink.